Doctors say a man who was plagued with coughing fits and other lung problems should be fine, now that they have removed a one-inch piece of plastic from his lung, where it had rested since he apparently inhaled it nearly two years ago while sucking down a soft drink at a Wendy's restaurant. But John Manley isn't so sure. Doctors at Duke University Medical Center say the plastic fragment of an eating utensil - with the Wendy's logo still legible on the side - was likely to blame for the coughing, fatigue and pneumonia spells that plagued Manley for almost two years. They pulled the fast-food foreign object from Manley's left lung during a Sept. 10 operation. The 50-year-old Wilmington, N.C. resident said he probably inhaled it while gulping a drink from Wendy's. "I like to take big gulps of drink," the former home remodeler said. "I don't know of any other ways of it getting in there." Manley said he and his wife were puzzled by his bouts of illness after moving to the North Carolina coastal city from New York about two years ago. He met with multiple doctors, who eventually determined there was a foreign object in his left lung. But they couldn't figure out what it was or the best way to remove it. "One doctor said they could remove my lung," Manley said. "I said no way. That was the easiest way for them, and I said I didn't think so." Manley told "The Early Show Saturday Edition" co-anchor Chris Wragge he was "quite shocked for something that size on get into my throat. I never felt it, and I didn't know it was as common, getting items in your throat and not feeling them, so I had no idea what was going on or what was causing my illness." He says whatever happened, happened in a hurry, telling Wragge, "It's a fast food place. They do things fast. You go in there, you eat fast. That's the only explanation. That's why they cal it fast food." Manley says his lung problems were so severe at times that he thought he was going to die. "I turned blue quite a few times and dropped. And actually, I'm getting sick again. I'm not over this at all. It's the same problem before I have an infection in my lung that hasn't been cleared up with a cocktail of antibiotics, the best you can get intravenously. It hasn't cleared it up yet. So, I'm going to have to go back on antibiotics and end up in a hospital again. I'm going downhill and I can feel it. I know the symptoms; it's starting again." Manley's case came to the attention of Dr. Momen Wahidi, director of interventional pulmonology at Duke. Wahidi, who mostly works with cancer patients to remove tumors from their lung airways, told Manley he would try extracting the object using a rigid bronchoscope. 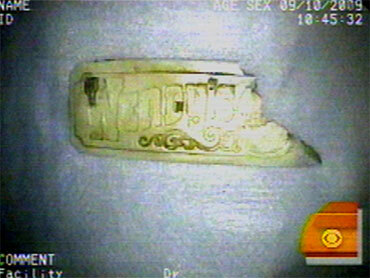 The procedure would allow Wahidi to insert a camera and other instruments to examine and remove the mystery object. Wahidi said he still remembers his staff's amazement in the operating room when they pulled it out. "We're looking at it and realizing that there are letters on it ... We started reading out loud, 'A-M-B-U-R-G-E-R,' and realized it spelled, 'hamburgers.' "
"Everybody was shocked. We had no clue why something that said, 'hamburgers' would be in someone's lung," he said. They had read a side of the plastic that spelled Wendy's motto of "Old Fashioned Hamburgers." Wahidi told Wragge, "The spoon was lodged in there for such a long time that it caused a lot of scar tissue, and when we went down and looked in his lungs, there was a lot of scar tissue. It took us awhile to remove it. ... I think now, there's still a lot of inflammation and scar tissue, and maybe an infection is setting in, so we'll probably have to take care of it, but the major (element) now is out, and I hope that things will get better and cleared in a month or so." Wahidi says foreign objects in the lungs are much more common in children, but he's extracted false teeth, nails, and even a peanut from adults who have held the items in their mouth and accidentally sucked them in. Patients often don't realize there's a problem until their bodies begin to react. But Wahidi said the piece of plastic was a first. "It's definitely one of the weirdest things I've removed in my career," he said. Manley said he's unsure if he will contact officials from Wendy's, based in Dublin, Ohio. Wendy's spokesman Denny Lynch said he has never heard of a situation like this in his 29 years with the company. He said company officials would contact Manley at the appropriate time. "We're as quizzed by the whole situation as everyone else is," he said. "This is quite a surprise that this could even happen."